Almighty ever-living God, whose Son was pleased to be welcomed in Saint Martha's house as a guest, grant, we pray, that through her intercession, serving Christ faithfully in our brothers and sisters, we may merit to be received by you in the halls of heaven. Through our Lord Jesus Christ, your Son, who lives and reigns with you in the unity of the Holy Spirit, one God, for ever and ever. Jesus liked to stay at the house of Martha, Mary and Lazarus, his friends at Bethany, when he was in Judea. One of these visits has ever remained dear to Christian memory. 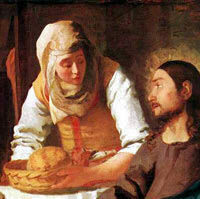 On that occasion Martha, busily serving the Master, asked Him to persuade Mary to help her. Without in any way reproaching Martha, Jesus explained to her that certain souls, called by God, should choose a better part still — the primary duty of listening to Him and contemplating Him. This feast is celebrated today both in the Ordinary Form and Extraordinary Form of the Roman Rite. According to the 1962 Missal of St. John XXIII the Extraordinary Form of the Roman Rite, today is the feast of Sts. Felix, Simplicius, Faustinus & Beatrice. Pope Felix II was martyred in Tuscany, Italy, in the fourth century. 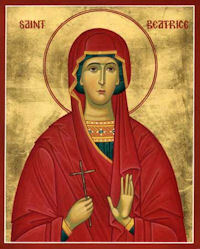 The brothers Simplicius and Faustinus and their sister, Beatrice, gave their lives for Christ at Rome, A.D. 303.